The Sanyo Wild Knights made it three in a row against a big rival, winning Saturday’s All-Japan Rugby Championship. 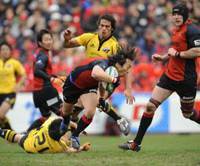 Sanyo topped longtime nemesis Suntory Sungoliath, winning 24-16 at Tokyo’s Prince Chichibu Memorial Rugby Ground before 12,000 spectators. Though quite familiar with each other, Sanyo and Suntory hadn’t expected to meet again like this. While Sanyo compiled a robust record for two straight seasons, third-place Suntory got a free ticket to the finals, with one week rest, as League winner Toshiba Brave Lupus withdrew from the tournament after wing Christian Loamanu’s B test for marijuana use came back positive. Loamanu has been suspended from Japanese rugby indefinitely. The two teams had met in both the Top League playoff Microsoft Cup and the All-Japan title last season with victory alternating from Suntory to Sanyo. This season, they played twice in the Top League, both encounters yielding decisive victories for Sanyo. Even though the same sides met in last year’s All-Japan finals, the atmosphere on the ground was markedly different. Suntory has struggled with finding a rhythm this season. Suntory had difficulty following Jones’ advice. In the first half, both sides seemed nervous and tense, concentrating on defense without risking too much action on the field. Scores came only from penalty kicks — three from Suntory center Ryan Nicholas and one from Sanyo fly-half Masukazu Irie — and Suntory led 9-3 lead at halftime. Sanyo fly-half reserve Tony Brown entered the field in the 20th minute of the second half, changing the game’s pace. The former All Black, who has recently recovered from a life-threatening injury of a ruptured pancreas, brought new confidence and organization to his side. Brown’s pass started an attack, resulting in the game’s first try as Sanyo’s substitute wing Takashi Yoshida scored, with a successful conversion by Irie. “All the reserve members that came off the bench added impact to the side and gave the team confidence,” Brown said. “We tried to move the ball a bit more in the second half. Brown’s wording is quite appropriate, as Sanyo’s second try, coming five minutes later, ended on a questionable note, where it seemed like Sanyo wing Tomoki Kitagawa dropped the ball before touching down behind the try-line. Sanyo benefited from the lack of TV match official at the game, and the score — initiated by Brown’s pass to Yoshida — was credited, together with Irie’s successful conversion. “This is rugby. There are different kinds of referees,” Sanyo head coach Hitoshi Iijima said, being diplomatic. Sanyo dominated the rest of the game, with a try placed by Kitagawa on the far right in the 33rd minute that Irie successfully converted. Suntory grabbed a final chance for a counterattack in the 35th minute, with Suntory wing Junichi Hojo scoring a try that Nicholas converted. That wasn’t enough to change the outcome of the game, however, as the Wild Knights earned their second All-Japan title in a row.